Discussion in 'Lexus Lounge' started by krew, Jul 27, 2017. Den, Trexus and bogglo like this. Fuel cell means electric drive, so whoever took those pictures should've been able to (not) hear if that was the case. Same as how the turbo whine gave away the earlier LS test mule. mmcartalk, maiaramdan and RAL like this. I think we are looking at a new ES mule, personally. Back and front ends don't line up for an LS. maiaramdan and RAL like this. I think it could be the next generation GS. or the next generation ES. Gecko, maiaramdan and RAL like this. Yes.....Ian's got a good point. An electric fuel-cell vehicle would be eeringly silent most of the time. Given the car's width (unless that is a optical-distortion from the camera-lens)........I'd say more LS than ES. It could be an old mule running FC before LS was shown in production form. But oh my did Toyota bet on the wrong tech here, hopefully it would turn out good for them as they could either use the technology for BPEV or be the leading FC manufacturer is some markets where FC will take off eventually. IMO the rear does not have any resemblance to LS can't tell from the front either. what stood out though is that rear looks like it has some kind of spoiler. I deleted a response I had written earlier supporting the idea this mule is not an LS, but a next generation ES. But, then I took the time to make a careful comparison between pictures of the current LS taken from the identical angles of focus we have in the three pictures of the mule. Everything seems to match ... down to the shape of the rearview mirrors. The C-pillar on the mule is camouflaged to actually mimic the C-pillar of the new LS. But this is just camouflage as is the heightened shape of what appears to be a rear spoiler. Carmaker1 has told us we can expect the next generation ES to begin production in August 2018 with an October 2018 launch at dealerships. So I would think we should begin to see ES mules about now. However, I don't believe this is one. 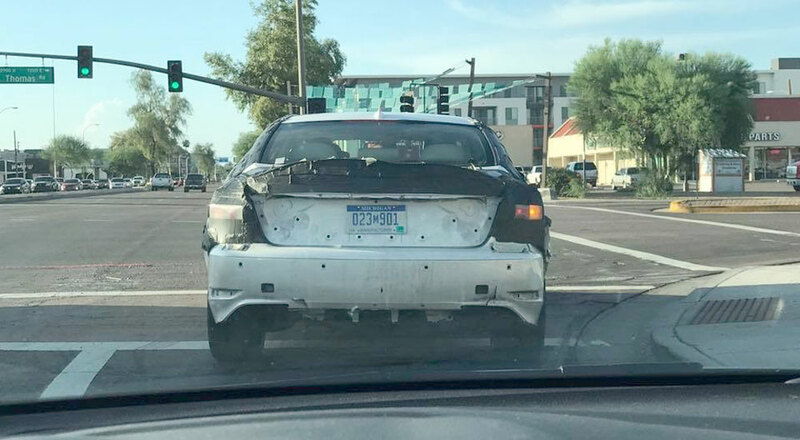 Third brake light is up top in the rear window. This is a characteristic of the LS. Ian Schmidt and RAL like this. LOL i thought they would be self-driving since Phoenix has a lot of SD vehicles testing as well.